Somebody having followed lately a bit the super-tournaments, knows that currently the American top-grandmaster Wesley So is hot. He is today undefeated for 56 games against serious opposition. He won during the last half year Sinquefield Cup, London Chess Classic, achieved gold with America at the olympiad and now also won Tata Steel Chess Tournament one point ahead of the reigning worldchampion Magnus Carlsen. At 2822 he is virtually the second highest rated person on earth (see 2700chess). Magnus has the first place since July 2011 but this can soon change. His success didn't arrive just out of the blue. Wesley talks in an interview at Chessbase that he hasn't used the internet for a year except to check some important mails. He neither has a cell-phone to avoid any distraction. I joked at schaaksite that strong players don't waste their time at discussions but Wesley is very serious. He is a model-example of hyper-professionalism. Despite this extreme dedication to chess we still detect gaps in his knowledge of openings. Wesley won a marvelous game in the 5th round against the Indian top-grandmaster Pentala Harikrisha but Chessbase later noticed that everything till move 14 was already played earlier in the high-class game Vladimir Kramnik - Ian Nepomniachti played at Dortmund in 2015. It is very weird that Wesley used 64 minutes to get to the position at move 14. Earlier I wrote on this blog an article about camouflage but spending 64 minutes to hide your knowledge of an opening is definitely nonsense. Besides Wesley afterwards also admitted that he didn't remember Kramniks game. The anecdote once more confirms what I wrote in an article of 2014 that it is incredibly hard to create and maintain a repertoire up to date. This problem is of course less critical for an amateur. Openings have a rather modest influence upon the final result of a game (see e.g. to study chess-openings). On the other hand I am still ambitious and I want always to insert something scientific in my games. Therefore I don't want to close my eyes for the opening-problems which I encounter. Only recently I realized the full magnitude of my problems. In my article studying openings part 2 I explain how I study since a couple of years much more thoroughly the openings. If we have a look at the figures then things will become more clear. Only checking my games of Open Leuven I noticed that I was out of book in 4 of the 7 games in a position which still pops up in more than 100 master-games of the mega-database. That is the opposite of what my persisting reputation as dangerous theoretician stands for. 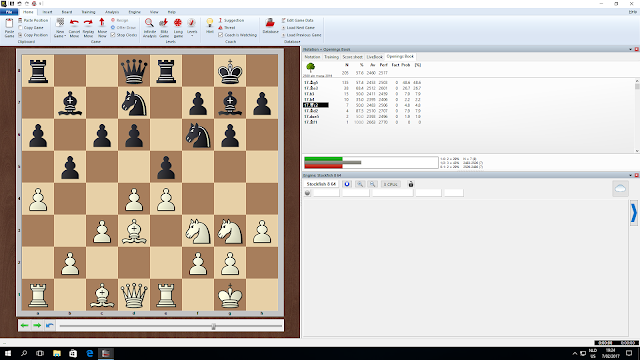 After my most recent interclub-round my opponent Joris Verhelst defended his non-standard opening-choice by stating that he heard of my enormous opening-knowledge. Well let us have a look at what I played at move 17 in my game of the 5th round in Open Leuven against Tom Barbe. Out of book in a position which still pops up in more than 100 master-games. Tom played a fantastic tournament (see final standings) and also in our game he showed that he was playing well by optimally taking advantage of my limited knowledge of the opening. Initially I was not happy about the draw as this heavily decreased my chances of winning the tournament. Later I realized that I couldn't really have hoped for more in the final position. Despite playing a very limited repertoire I haven't met this line anymore in the last 10 years in a standard game. It is recurrent problem which I link to a lack of experience. The Belgium IM Stefan Docx already advised me to play (much) more if I want to grow as a chess-player. I also realize that playing averagely 23 games each year (see previous article) is way not enough. In the end it is a matter of setting priorities. Chess is very important for me but I don't want to sacrifice everything for it so I deliberately made the decision to reduce my chess-activities 10 years ago. Contrary to many contemporaries whom stopped playing chess, I learned to accept my limited knowledge of openings. Besides as HK5000 once told me, from each game played you still learn something. On the other hand theory is evolving so quickly that I get the feeling that my pace only gets me further behind. For the time being I don't see a visible improvement with my renewed method of studying openings. Maybe the (nearby) future will improve things especially if my son Hugo will start to enjoy playing serious tournaments.